OK, I won't go that far back. 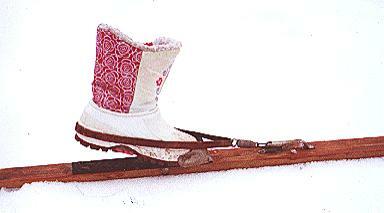 I began skiing in the backyard when I was six years old (1962). 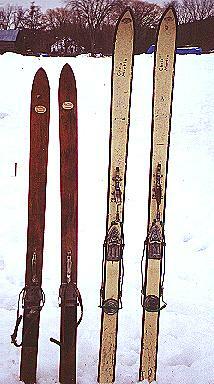 Santa had brought me a pair of wooden skiis with a metal toe piece and leather straps for your regular snow boots. Without the benefit a Professional Instructor I stumbled and fell alot, but I still managed to have fun and get up and down the hill in the backyard. For Christmas 1967 Santa gave me a five day learn to ski week at Willard Mountain. I had acquired some better equiptment from a neighbor with a turntable toe piece and a cable heel. This was it! A T-bar to get up the hill and as many trips down as I could make in a day. Back then the Lift ticket system was like $7.00 for a whole day ticket or .50 per single ride ticket. You had to make fourteen runs and then you were "Skiing Free"
Subsequent years of Birthday (December 19th) and Christmas presents brought better equiptment used on High School and 4-H Ski trips both single day and weekend length. Some memorable trips during the Late '60s and Early '70s were to Birch Hill, Bromley, Dutch Hill, Easton Valley, Haystack, Jiminy Peak, Prospect, Rock Candy Mountain. Some of these are now lost but you can see them by visiting New England's Lost Ski Areas Project. During my eight years in the Navy I had the opportunity to ski in New Zeland, Korea, Japan, Italy, Germany, and even Mauna Kea on the Big Island of Hawaii. When I returned home to the Albany, NY area ('81-'89) I became very active in the Single Ski Club and the NY Capital District Ski Council. As President of the Council I was blessed to be the guest of the French Government Tourist Office on a ten day Fam Trip to Val D'Isere, Tinges, Les Arcs, and Chamonix. 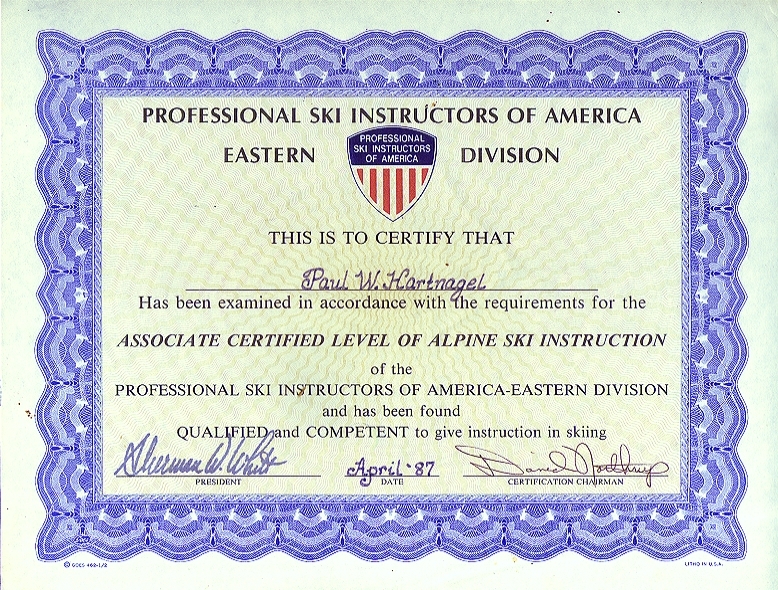 In 1986 I began my career as a Ski Instructor. New England's Lost Ski Areas Project. I began Teaching Skiing in the 1986-87 season. For my P.S.I.A. Registration Clinic I attended the 5 day Instructor Training course at Mt. Snow, VT in early December. Otto Frei was my course conductor and boy what an experience. He totally corrected my thinking on teaching and rather than teaching me how to teach he made sure I learned how people learn. I taught Full Time six or seven days a week at Jay Peak, VT to get my 150 hours in by March. Then I took the two day Exam Preparation course at Greek Peak, NY. My course conductor, and still good friend was Ray Allard. Then over the three days of April 1,2, & 3, 1987 at Loon Mt, NH I passed the Associate Certified (now called Level II Certified) exam. During the '88-'89 ski Season I taught full time at Whiteface Mt. and lived in Lake Placid, NY. In August of 1989 I married a young lady that did not ski and for ten years my skiing was pretty much limited to the required update clinics. When my daughter turned 6 years old I wanted to get her on skiis and joined the Ski Windham Snowsports School. I currently teach at Killington, VT.